One of the more attractive and interesting tourist regions in Croatia is the Sibenik Riviera which is located in the northern part of Dalmatia. Its inland is encircled by the Dinara Mountain. It stretches along the coast from Pirovac on the west to Razanj on the south and contains more than 200 smaller and bigger islands as well as reefs above sea level. Crystal clear water, beaches, islands, vineyards, authentic fishing villages and the ruins of medieval towns surrounded by walls are only a few of many beauties of the Sibenik Riviera. That which makes it very special are the two pearls of nature – national park Kornati with over 89 beautiful islands and reefs and national park Krka in which the river Krka fights its way through a tight canyon for 72km, trying to find its way to the Adriatic Sea, leaving magical cascades, waterfalls and lakes behind. Sibenik is a cultural and administrative center of the Sibenik Riviera, as well as a neighbor to attractive locations such as Vodice, Rogoznica, Primosten, Zaton, Pirovac, Tisno, Tribunj, Srima, Brodarica, Zaboric, Grebastica, Sparadici…. Islands of Murter, Zlarin, Zirje, Kaprije, Prvic and Kornati exude tranquility and intact nature enriched by Mediterranean scents. It is exactly because of the numerous islands that the Sibenik Riviera is one of the most attractive areas for sailing in Croatia. A total of 13 yacht marinas satisfy the highest of the criteria. Marina FRAPA in Rogoznica has been the best marina in Croatia for years. The Sibenik Riviera is proud of its excellent bathing places, as well as of the beautiful beaches. The Lolic beach in Pirovac, the Blue beach in Vodice and the White beach in Solaris have been awarded Blue flags. For family tourism, adapted villages and locations such as Solaris, Primosten, Rogoznica, Murter, Vodice are exactly what attracts many families. Sibenik is a town which successfully connects the famous past with the gift of natural beauties. The nature has granted the richness of the islands bathed in the blueness of the sea and fascinating scenery of the Krka national park to the town the name of which was used by the kings. Sibenik is the town with the largest number of music organs and stairways in Croatia. Besides the remarkable historical monuments, Sibenik has a fantastic catering offer, malls, movie complexes, four forts the most visited of which are the St. Mihovil fort and one of the best sea forts on the Mediterranean, St. Nikola fort. You will be enthralled by the famous St. Jakov Cathedral, the most valuable renaissance building in Croatia. Do not miss to visit wine bar Bunari (Wells), a great place to go out to, where different musicians perform all year long. Vodice is a tourist center known for its vividness, a versatile tourist offer and a wide choice of private accommodations. The place is rich with tradition and antiqueness, ideal for a vacation imbued with rich contents. Visit numerous cultural monuments which will retell the past of Vodice. Some of the monuments are the Church of Karmel (Okit hill), Coric tower, St.Kriz church, St. Kriz parish with a bell tower and St. Ilija church. During the day go for a swim or sunbathe on the attractive beaches, the more popular of which are: partly pebble and partly paved beach Hangar and sandy Blue beach which is especially interesting to the children. There are numerous sports possibilities, as well. In the evening hours enjoy a walk along the shore, savor the specialties of this area in one of countless restaurants (fish, fritters, krostule – dessert, homemade wine…) or board an old sailing boat that will take you for a night tour of the sea archipelago. Rogoznica is a quiet Mediterranean place known for its pebble, paved and rocky beaches where everyone can find their corner. Because of the wide selection of accommodation next to the beach or in its immediate proximity, it is an ideal destination for a family vacation. Sports and recreation lovers can enjoy countless water sports, hiking and many other activities. You will encounter numerous restaurants that offer homemade specialties while walking along promenades. Be sure to visit the “Dragon’s eye” lake, a natural phenomenon. Primosten is a small place located about 27km from Sibenik. The old part of the town is situated on a small island which is connected to the land by a bridge. The bridge has been replaced by a bank thus making a peninsula out of Primosten. The town has preserved its Mediterranean atmosphere and all the features of the Mediterranean fishing town, which is mostly evident in its long narrow streets and compact stone houses in the old core of the place. Primosten is rich with long pebble beaches and a nice promenade. The well-known beach in Primosten is the Raduca beach. During summer months numerous manifestations are organized in Primosten, such as: Primosten uzance (the habits of Primosten), fishing night, folklore nights and folk music nights. For those who are interested in more lively fun there is the discotheque Aurora, one of the most popular clubs on the Adriatic. If you want to savor different specialties of Primosten, visit the restaurant “Staro selo”, “Amfra”, tavern “Jerko” and “Torkul”. The climate of the Sibenik area is distinctively Mediterranean with 2710 sunny hours per year. The temperatures are relatively high during summer, but they are restrained by the pleasant wind maestral (blows from the sea towards the land). The summers are dry while the winter has more rainfalls. - St. Jakov Cathedral – the most valuable renaissance monument in Croatia the building of which started in 1431 and belongs to the UNESCO’s world heritage. It was built entirely in stone, without the use of other materials and contains more than 70 portraits on its apses. The small square that surrounds it is one of the most beautiful Croatian squares. - The old core of Sibenik with numerous churches, forts and castles from 14-17th century that were pronounced cultural monuments. - St.Mihovil fort – the fort from 15th century is located on a 70m high slope above sea level as well as above the old town agglomeration offers an amazing view over the town of Sibenik and the Sibenik archipelago. - Coric tower – family Fondra built it in 1646. The housing and defending facilities are surrounded by high wall because the tower was built during a very restless age. During summer, you can enjoy movie shows in the tower’s back yard, but you cannot enter the tower due to its ruinous state. - St. Kriz church – a gothic church built at the beginning of the 15th century. It is known for a valuable detail, an old romantic-gothic baptistery on a pillar, the only of the kind in this part of Dalmatia. During summer, exhibitions are organized throughout the day in the church, predominantly modern art exhibitions. - Parish St.Kriz with the bell tower – this church was built on the foundations of an older chapel, it is baroque and a masterpiece of the craftsmen from Sibenik, Ivan Skoko. The bell tower is the work of the craftsmen from Dubrovnik, Vicko Macanovic, and was in the process of building for 20 years. - Parish – built in 1615. It is located in the old part of Rogoznica, on top of a hill from which you can see the entire panorama of Rogoznica. - Virgin Mary chapel – located on the point of the Gradina peninsula and is dedicated to the patron saint of the Rogoznica locals. The legend of the miraculous Virgin Mary’s image is attached to her devotion. - St. Juraj parish – built in 1485 and was restored a few times. The icon of the Virgin Mary with a silver brace is kept inside the church. - St. Roko church – built in the 17th century, it is a valuable cultural monument. The Sibenik Riviera is located in the very center of the Adriatic and has the most favorable excursions possibilities. The Krka national park includes the area by the Krka River that flows through a picturesque 75km canyon. Even though it can be reached by a car, the most attractive access is by boat. You will be thrilled by the waterfalls and cascades in the rich greenery. There is also Skradin, a small town on the shore of the river Krka, where the salty and sweet water mix. Skradin is a town of traditional gatherings of Dalmatian folk music groups (klape), proud of its 2000-year-old history as well as of it rich gastronomy offer. Go for an unforgettable boat trip to the Kornati national park with an archipelago of about 150 islands, 89 of which are included in the national park. The islands are characterized by barren vegetation, lack of the flowing water, crystal clear water and a number of coves and reefs. The Sibenik Archipelago offers the possibility of an excursion to the Krapanj island where you can see the tradition of extracting and cultivating sponges, to the Zlarin island where you will be thrilled by the tradition of extracting and cultivating corals, as well as jewelry production. There are two more national parks in the surroundings – National park “Paklenica”, famous among alpinists, and the national park “Plitvice lakes”. We recommend you visit The Hawk center in Dubrava to experience one of the oldest cultures of our planet. Visit Tribunj, a small fishing resort about 2km west of Vodice. The historical core was built on a small island which is connected to the mainland by a bridge. Ethno village in Burnji, near Primosten, offers a special experience. Burnji characterizes the life of the Dalmatian farmer, known for a donkey safari, an animal close to being extinct. Do not miss the adventure of rafting on the rivers Zrmanja or Cetina. 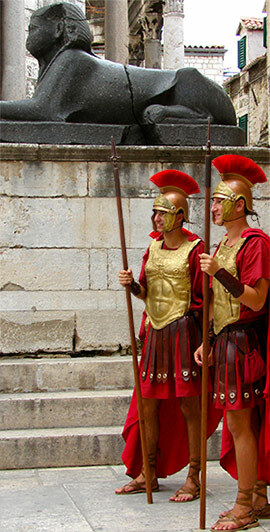 Visit the historical towns in the surroundings; Split – a town built out of a 1700-year-old palace by a roman emperor Diocletian from 295-305 and Trogir – UNESCO protected town, well-known for its joyful summer nights and locals and visitors festivities. The Sibenik Riviera with a rich natural diversity offers countless possibilities of sports. Water sports are well represented so you can enjoy sailing, water skiing, windsurfing… Diving in the Kornati archipelago is a special experience. The adventurists’ heaven is rafting on the river Zrmanja. For a true dose of adrenalin try bungee jumping off the bridge in Sibenik. The height of the bridge is 40m and the range of the arch is 362m. You do not have to have any pre-experience to begin with the bungee activities. All you need is a bit of good will and courage (and money to jump) on you – every year from 01.07.-01.09. (on working days from 10:00-20:00h; on Sundays from 10:00-14:00h). The gastronomy tradition of the Sibenik Riviera is somewhat similar to the Italian cuisine which is a direct result of the long reign of Venice on this area in the Middle Ages. Fresh groceries, simple preparation seasoned with parsley, onions and laurel are the characteristics of the cuisine of this area. The most popular specialties are fried fish, mussels in stew, sea food risottos, roasted lamb and roasted pork with potatoes and salad. The most famous specialty of the Sibenik inland is prosciutto and cheese. We recommend red wine “Babic” from the famous vineyards in Primosten – the vines have been cultivated on the cascade balconies in the Sibenik littoral. Homemade schnapps is a specialty– made of vines or herbs, as well as some dessert wines – prosek and marastina. Rozata – an egg, milk and caramel cake and Fritule – made of dough eith raisins and likers are the traditional desserts in the cuisine of Sibenik. If you can appreciate fine food, be sure to visit the TicTac restaurant with fish specialties on the island Murter or the famous tavern Saricevi Dvori which is located in the ethno village Burni not far from Primosten. It has a rich offer of homemade specialties the inevitable guest of which is Michael Schumacher during his visits to Croatia. Visit the International children’s festival, Cultural summer of Sibenik and the evenings of the Dalmatian song, which have become the summer tradition of Sibenik. In September, the town changes into a renaissance robe, seeing how the medieval fair is organized then, taking us back in the ancient history. Those who want to have fun until the early hours of the morning need to dance in the discotheque Aurora in Primosten or Hacienda in Vodice, where the young from all over the Adriatic have fun.